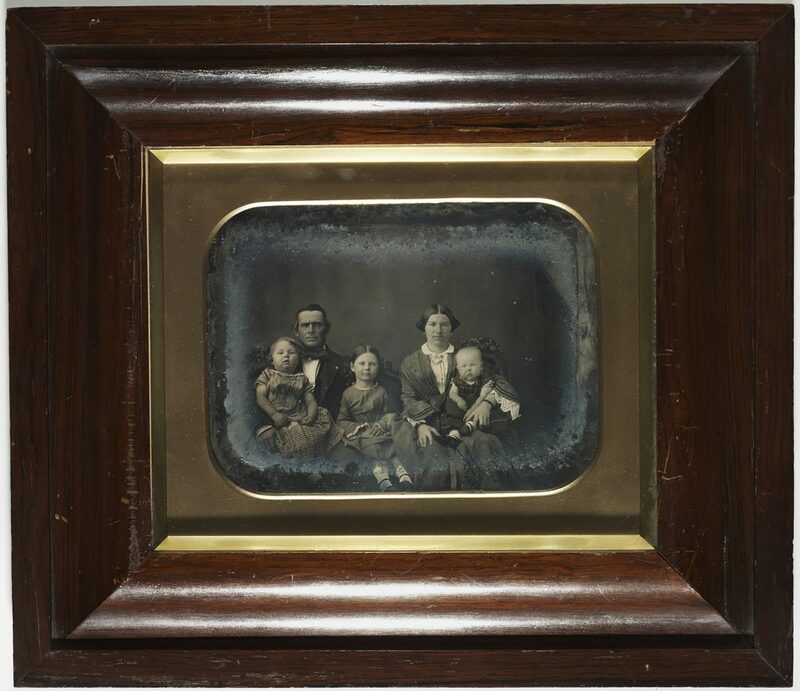 This whole plate daguerreotype shows George Walker Johnson, aged 43, his wife Ann, nee Ellison, aged 25, and three of their 13 children: from left to right, George William, aged 3, Elizabeth, aged 6, and John Simpson, about 12 months. The photograph appears to have been taken in summer – the short sleeves of both boys’ dresses show distinct tan lines on their upper arms and all the children wear socks rather than stockings. It can be dated quite precisely, based on the ages of the children, between late 1854 and the death of little George Jnr on 30 January 1855 (South Australian Register, 31/1/ 1855, p.2). To minimise movement through the long exposure time, the Johnson’s have been carefully arranged by the photographer who has seated the parents (probably with posing clamps fitted to their necks) at either end of an ornately-carved rococo revival style sofa holding the younger children in their laps to keep them still. George Jnr nestles into the crook of his father’s arm and leans his head back against his shoulder, holding onto his skirt to keep his hands still. He wears a light-coloured [cotton] dress with dark piped trim at the neckline and edges of the narrow ‘mancherons’ and short sleeves, above a loose-fitting pleated bodice and striped/piped skirt. His short hair is brushed into a side parting signifying his gender, and he wears short white socks and square-toed, dark [leather] shoes with buttoned ankle straps. George Snr wears an unmatched ensemble of business clothes comprising a [double-breasted] dark wool jacket with black waistcoat and lighter coloured trousers, over a crisp white shirt with a winged collar and loosely tied [silk] neck cloth. His face is deeply-tanned, his cheeks clean shaven above a fringe of beard, his dark hair with a side parting carefully combed back from his forehead and curling over his ears. Elizabeth, in the centre of the image, wears a plain [cotton] full-skirted dress with a pleated bodice and a high, round neckline edged with a narrow white-work frill above its dropped shoulder line and pagoda-shaped sleeves trimmed with dark piping and a broderie-anglaise edging. Her dark hair is centre-parted, pulled back smoothly behind her head. She wears [gold] sleeper earrings and short white socks with her squared-toed, dark leather, ankle-strapped shoes. Ann Johnson’s plain [cotton] dress also has a wide-spreading skirt and pleated bodice, fanning up and over the shoulders from a shirred, peaked panel at the waist. The front of the corsage probably fastens with hooks or buttons but has been left open, with the edges tucked in, over a white [cotton] ‘chemisette’, or undershirt, with a [false] button and placket opening below a pointed, turn-down collar with a pale ribbon tie and brooch. Her ¾ length ‘pagoda’ sleeves are trimmed with two rows of dark piping and worn with Vandyke-pointed white-work embroidered [cotton] undersleeves, left open at the wrist above a pair of [jet] bracelets. She wears her centre-parted dark hair with side loops wrapped high over her ears, fitted with gold earrings, forming a somewhat horned appearance. Baby John wears a dark [cotton] short-sleeved dress with fitted bodice and full skirt trimmed with lighter [silk] ribbon trim and short white socks with dark [leather] button-fastening baby shoes. Compared to the more formal attire usually recorded in the early photographic era, the Johnson family appear somewhat casually dressed – they actually look hot, sticky and even a little grubby – which could suggest that the image was the result of an opportunity seized rather than a carefully planned visit to the daguerreotypist’s studio. The whole plate option would also have been an expensive choice at the time. This rare image does not record famous people but rather an average nineteenth century family. Fortunately, it has survived with extensive family detail supplied by descendants. George Walker Johnson (1811-1902) belonged to an old Lincolnshire family. A builder and contractor in Manchester, he immigrated with his first wife to Adelaide 1839 where he started a timber yard and Adelaide’s first quarry and was also engaged in contracting and farming. Following his wife’s death, he married 18 year old Ann Isobel Ellison (1829-1904) on 18 March 1847, at his residence in Mt. Barker, South Australia. Ellison, aged 11, had arrived in South Australia with her family in the early 1840s. The Johnson’s had three children in Adelaide including Elizabeth (1848-1924) and George William (1851-1855) before the outbreak of the 1850s gold rushes in the eastern colonies. In 1852, the Johnsons travelled overland to Kyneton, Vic., a major supply town for the diggings, where the family settled and John Simpson was born on 19 November 1853. Johnson worked as a contractor; he had carrying business in Melbourne, a grocery business in Kyneton and owned the Ellison estate on the Coliban River. A freemason, Johnson was also prominent in municipal affairs; a member of the Kyneton shire council, he was elected as Kyneton’s first Member of Parliament in October 1856. George W. Johnson Esq. M.L.A. lived with his wife and family at his residence Innisfree (1863-64) (later Gainsborough House), located at 66 Jennings Street, Kyneton, which remains architecturally and historically significant at local level, as one of the oldest houses in the town and its shire. Mr and Mrs Johnson celebrated their golden wedding on 18 March 1897, and died at Keyneton within two years of each other in 1902 and 1904. On the 18th Mar, 1847, at Parkside, South Australia, by the Rev. T. Q. Stowe, George Walker Johnson to Ann, eldest daughter of William Ellison, Glen Osmond, S.A.
– Ann Ellison Johnson, d. 16 July 1904, a colonist of 64 yrs. The Argus, Tue 19 Jul 1904.